In addition to our weekly Torah classes, Orah organises social events and activities for women and post-sem girls in the local community. Orah works in partnership with individuals and other local organisations to co-ordinate and host a range of different events and activities. You can read about some of our social events and activities below. If you have your own idea for a social event or activity, and would like to discuss the possibility of working together with Orah, please do not hesitate to contact us at info@orah.org.uk. 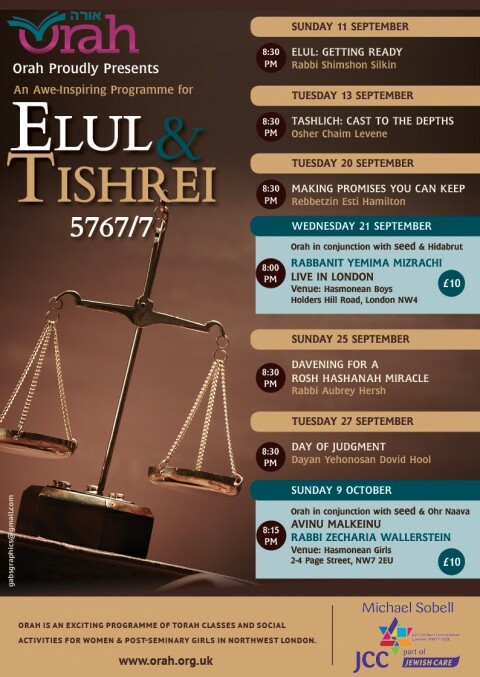 Throughout the summer of 2012, Orah held a monthly shalosh seudos for ladies and girls on the Shabbos before every Rosh Chodesh. During the subsequent winter months, this was replaced by a Friday night oneg. These informal events were hosted locally and featured a warm atmosphere, great food and an inspiring guest speaker. They were attended by women and girls of all ages. Click here to read the write-up in the Hamodia and here to read the write-up in the Jewish Tribune. If you would like to take over this initiative or organise something similar through Orah, please contact us using our contact form. 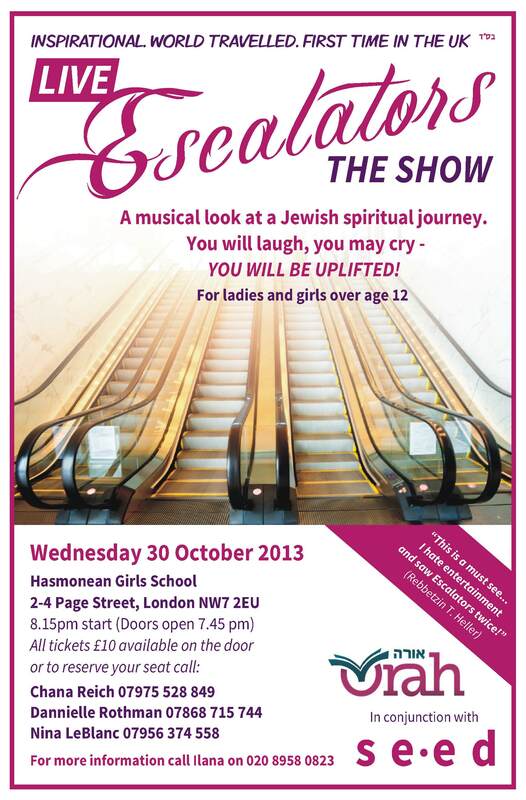 In January 2013, Orah hosted a unique and stirring evening of song and inspiration on the theme of tefillah. 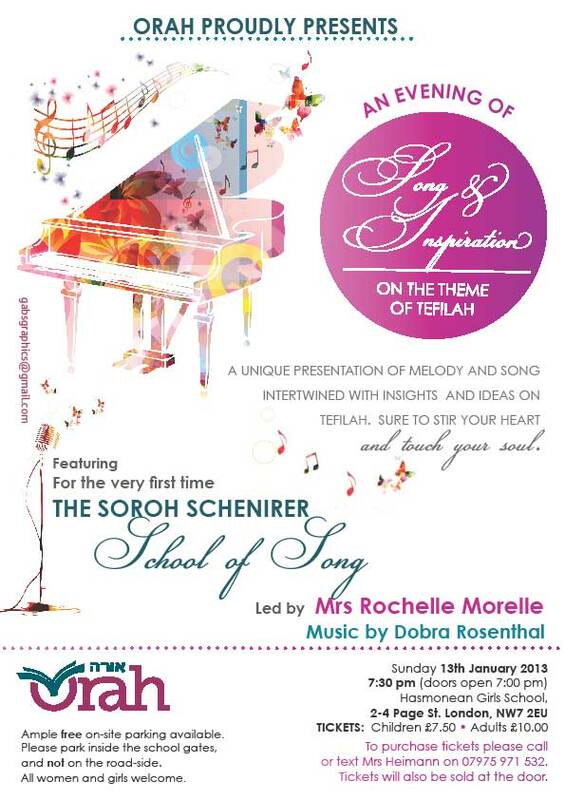 Featuring the Soroh Schenirer School of Song live for the very first time, the evening combined beautiful melodies using words from familiar tefillos with inspiring words from three guest speakers, who enriched the audience's understanding of and appreciation for three different areas of tefillah. The evening was a wonderful success, and all who attended left the event inspired by the beautiful young voices and the insightful ideas offered by the guest speakers. In October 2013, Orah teamed up with seed to bring Escalators over from Israel. 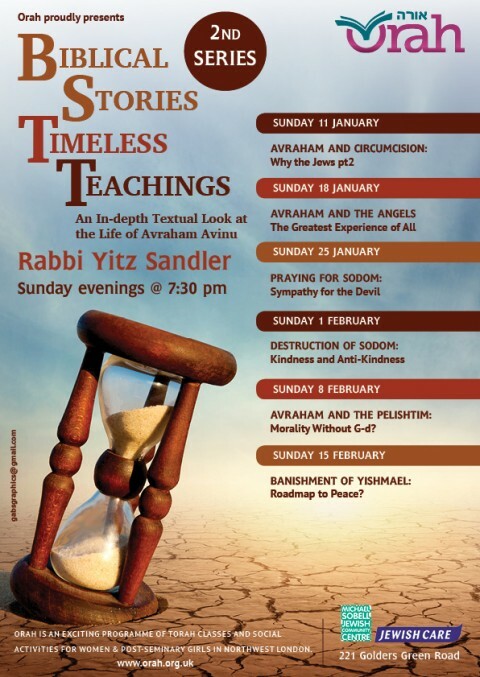 This hilarious and heart-warming performance follows the individual life stories of four baalei teshuvah as they make their personal spiritual journey from a secular lifestyle to a religious Orthodox one. The talented performers - all of whom have a performing arts background - used a unique combination of dance, drama and song to provide the audience with a very honest and down-to-earth insight into the inner-struggles, questions and challenges they faced along the way. This highly original performance was both inspiring and eye-opening, and will certainly be long remembered by the hundreds of women who attended the show. Since its inception, Orah has run regular evening netball games at Hasmonean Girls School. For more information, or if you would like to co-ordinate your own game, please email info@orah.org.uk. 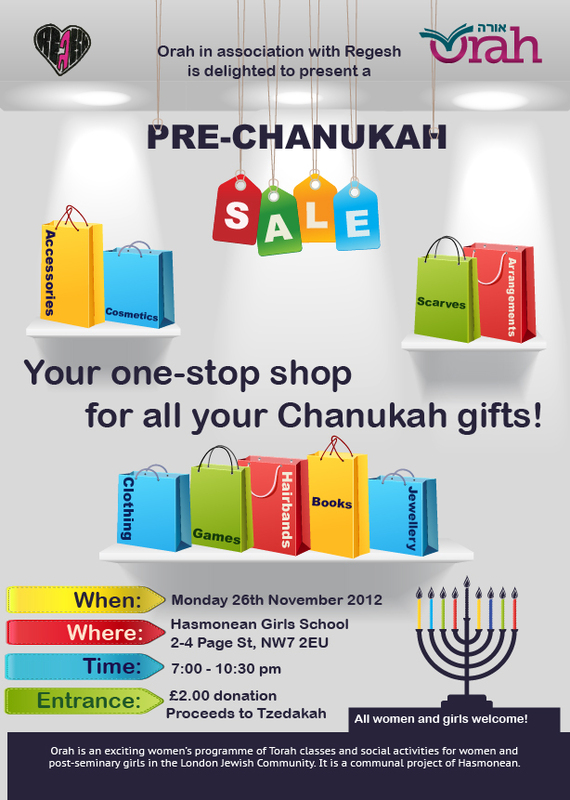 In November 2012, a few weeks before Chanukah, Orah held a pre-Chanukah bizarre at Hasmonean Girls School. Featuring over 25 stalls selling everything from headscarves to homeware, jackets to jewellery, and tapestries to toys, the fair was the perfect one-stop shop for women to take care of all their Chanukah gift purchases in one place. The variety of products on offer was astounding and guaranteed that there was something for everyone. Orah is extremely grateful to the girls of Regesh for their invaluable help in organising this event. In 2013, Orah teamed up with the Michael Sobel Jewish Community Centre for a similar pre-Chanukah fair event - but this time with an added twist. In addition to the wonderful gifts on sale, the evening also doubled as an open-mic night, giving song-lovers the opportunity to showcase their singing talents live before an audience. The singers performed a wide variety of songs, maintaining their energy and passion until the very end of the evening. Orah would like to thank all those who assisted with and took part in this event. 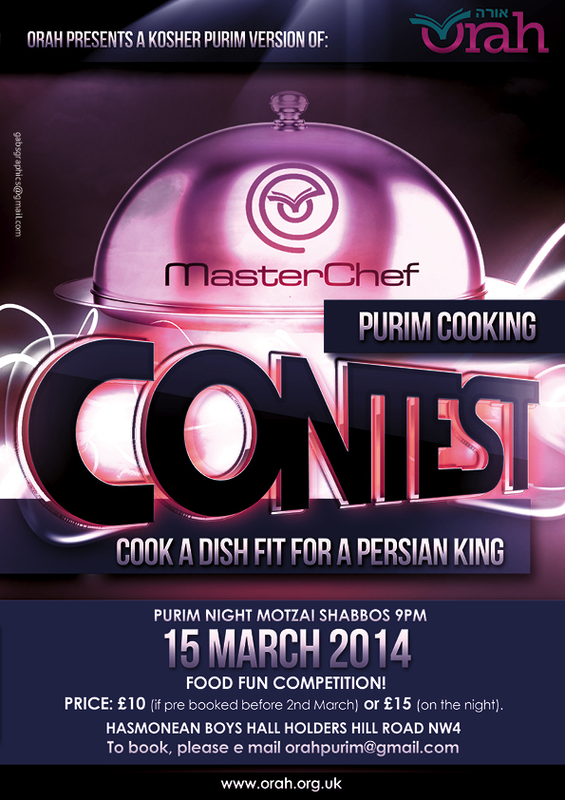 Purim night 2014 was uniquely celebrated at Orah with an original MasterChef event held at Hasmonean Boys’ School. Participants were given ingredients and utensils and had to compete to make foods from different nationalities. In true Purim spirit, participants were transformed into professional sushi chefs and skilled pancake makers as they whipped up their own exquisite creations. A highlight of the evening was the delicious cocktails mixed and subsequently enjoyed by the participants, while fresh fruit and a chocolate fondue was another fun speciality. A lively Purim atmosphere pervaded the evening and all those who took part enjoyed a wonderful time. 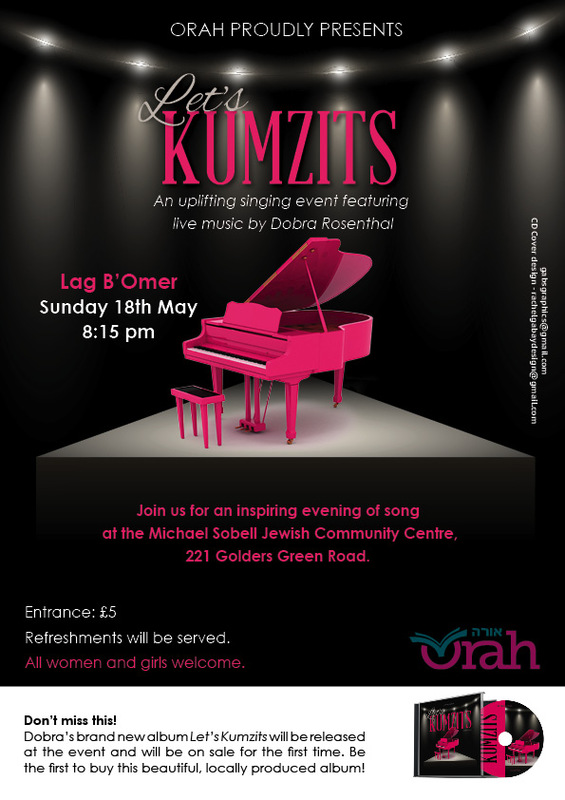 As part of its social programme, Orah arranged a Lag B’Omer Kumzits event for women and girls in the local community, featuring live music performed by Dobra Rosenthal. The event was very well attended, with over one hundred women and girls taking part. A number of singers led the singing programme, which incorporated a huge range of songs, both English and Hebrew, traditional and new. The programme of songs was divided into sets according to themes, and included groups of songs on Teffilah, Dveikus and Geulah, to name but a few. The singing went on until late in the evening, evidence of the warm and uplifting atmosphere at the event. The Kumzits also marked the release of Dobra Rosenthal’s debut album, aptly named Let’s Kumzits. This locally-produced album features girls singing Kumzits-style songs, with music and vocals arranged by Dobra Rosenthal. What a beautiful and well-rounded summer programme! Thank you for your continued efforts.